Frank’s mother descended from Dutch burghers. They peered from the frames of their oil portraits, clasping silver goblets while hunting dogs lurked in the background. His father’s forebears emigrated from the Isle of Man. The family settled in New Jersey, where the father became a minister. All of the sons and daughters stayed nearby, except for one. That would be Frank. The passion of Frank Bergen Kelley would always lie across the river. It was the history of New York City. Frank couldn’t wait to get to a place where he could influence how new immigrants, in particular, would learn the history of their nation. Planning to become a teacher, he earned three degrees from New York University in rapid succession, emerging with a doctorate in 1890. 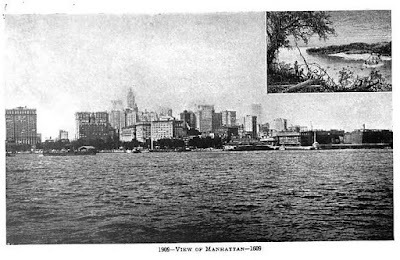 Then he set off to teach at several military academies before landing, in 1899, at DeWitt Clinton, one of the city’s preeminent public high schools which drew boys from across the socio-economic and ethnic spectrum. For the next 34 years, this would be the perch from which Frank sparked the connection between citizenship and education. He did not frown on flag-waving; rather, he believed that a deep understanding of history would nurture the most meaningful, enduring patriotism. He also believed that learning history demanded full engagement: eyes and ears, thinking, exploring. Henry Hudson's voyage up the "North River." 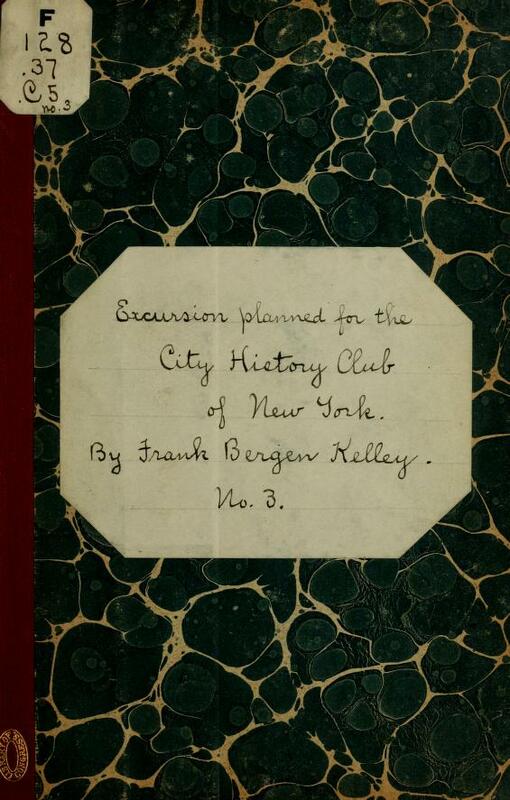 Soon enough, Kelley came to the attention of the leaders of the City History Club of New York. Established in 1896, the club was run by a mix of Gilded Age millionaires, the heirs of Knickerbockers, and socialites, with a sprinkling of antiquarians and genealogists. The trustees invited Frank Kelley to become superintendent of the club. He accepted with delight. What a perfect fit: while the board raised money by hosting balls and auctions, Kelley created an educational program comprised of lectures, self-guided tours, and exhibitions. It was publicized widely. Recent immigrants especially were encouraged to enroll. In rapid order, Frank produced at least 12 pocket brochures, including: A Guide to Greenwich Village, A Guide to Fraunces Tavern (where General George Washington, in 1783, bid farewell to the officers of the Continental Army). The board of education distributed these free of charge. And he lectured all the time, all over the city, in libraries and halls and schools. Each year he would deliver several series of ten talks, open to the public at no charge, on “The History and Government of New York City.” Five Sunday afternoon excursions were part of each series. Often Kelley lectured as part of a group. Guest speakers included college presidents, diplomats, and professional historians. 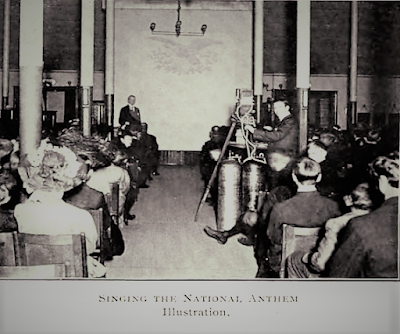 In 1903, more than one million New Yorkers attended public lectures. 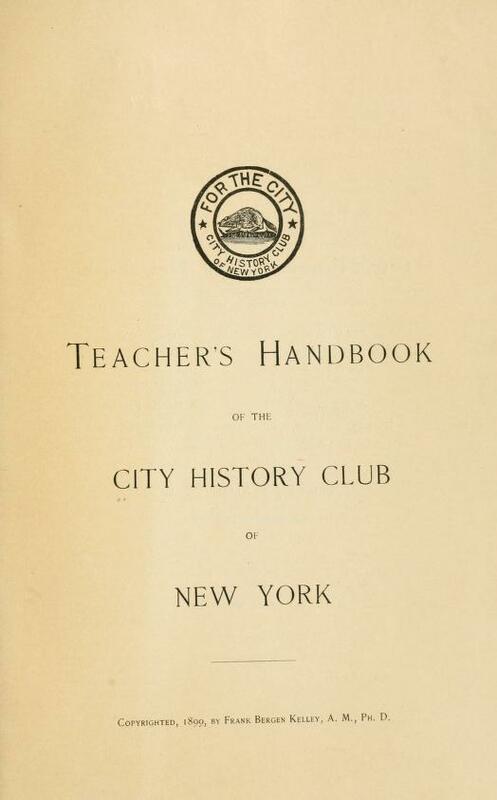 By 1906, when the City History Club celebrated its tenth anniversary, its programs were thoroughly entwined with the work of the public schools. 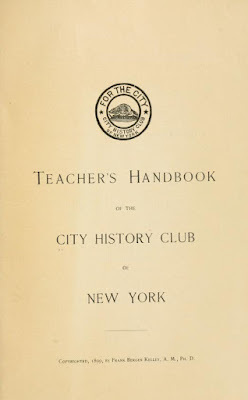 This meant that the club’s officers, trustees, vice presidents, and advisers had a stake in the education of all children who lived in New York City. Supporters included the descendants of New York's founding families: Virginia Gildersleeve (Dean of Barnard College), George W. Wickersham (U. S. Attorney General and internationalist), Mariana Van Rensselaer (historian and reformer), Robert De Forest (longtime trustee of the Metropolitan Museum of Art), and Frank A. Vanderlip (journalist and founder of the first Montessori School in the U. S.). Lovingly guided by Frank Bergen Kelley. See also December 13, 2017 post. I'm immediately obsessed with the name, "Virginia Glidersleeve."